Here you are landing, escaping from the attacked Adventurers' Guild from the surface. 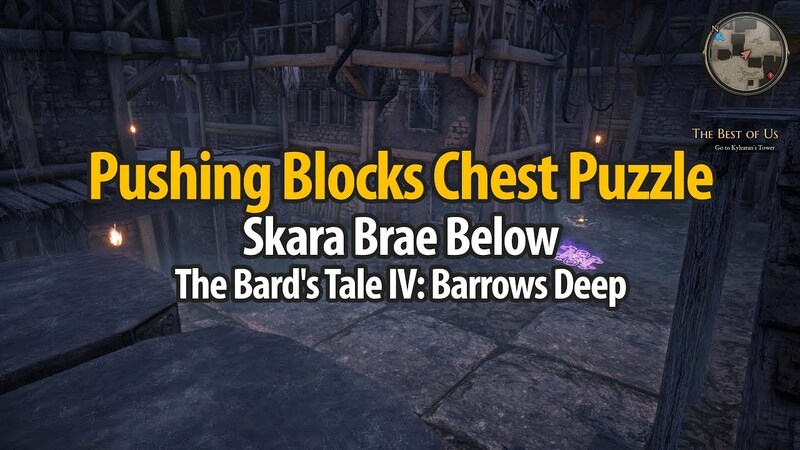 A HOME IN THE DARK With the Adventurers' Guild in flames and Bishop Henred's Paladins hot on your trail its time to regroup in the subterranean streets of Skara Brea Below. You can use Torch to light you way underground. You can save game here. Cutthroat Dragonsbile Bomb pick it up, you will need it. Do not go West (Soldiers), just loot chest and use Cutthroat Dragonsbile Bomb on Burnable Barrier. Pass enemies sneaking near walls on left, head East. Do not try to fight them now. Look at mini map how enemies are moving and avoid them. Move wall twice to make shortcut to the place where you came from. Use Hidey Bide and pick Hidden Throw Stash. A STABBING HEADACHE Strange sounds and light are coming from over near Harkyn's Castle. Best to check it out. 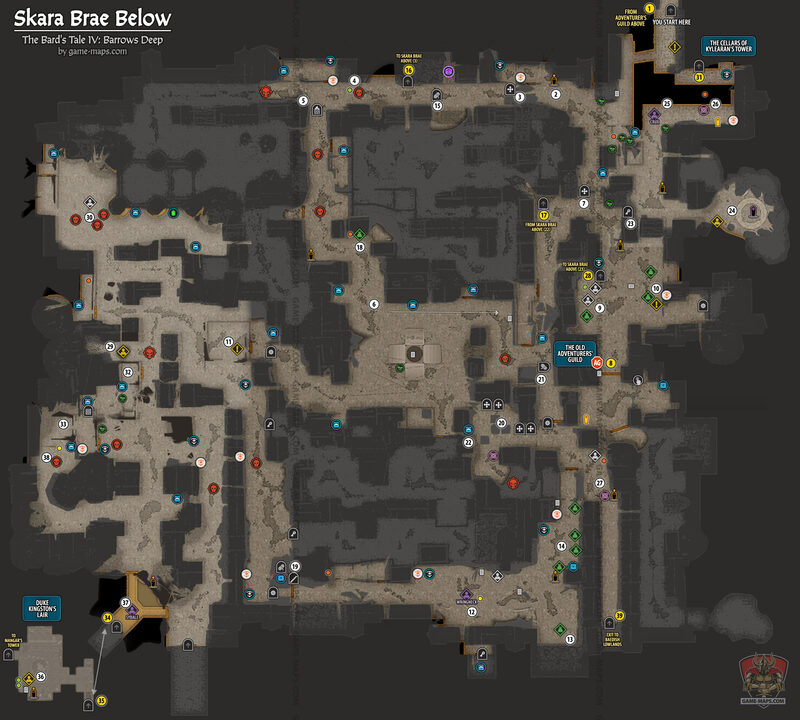 Continue [Bad Reputation Quest], follow blood trail to the North and open Cog Locked Door to make shortcut. Following blood trail, you will be stoped by Wringneck to learn Hidey Bide Exploration Song. Hidey-Bide - Here you learned next Song of Exploration (Ability) Hidey Bide, it reval hidden throw stashes marked with the throw's secret sign. and use Hidey Bide to reval Hidden Throw Stashes that should be visible near for a moment. Now you can check other Throw's Secret Signs you pass by before. You have to use (15) first. This passage will be open after you finish Green Lady's House. Use Roscoe's Magical Lantren on Place Lantren. Return for Roscoe in Adventurers' Guild. Roscoe Vendor, he will be here after Spells is What We Sells Quest. Climb Stairs, Use Grappling Hook and open chest. Stone Remembers sign on the floor will reset bricks (if you can sing this song). Use Grappling Hook and climb up. Take upper path and open chest. Open doors with Alguin's Gate Key from The Best Of Us Quest. Take The Highroad In these troubled times, speed is of the essence. Learn how to use the standing stones to move swiftly from place to place. Play Wildland's Whistle near stones in this room. 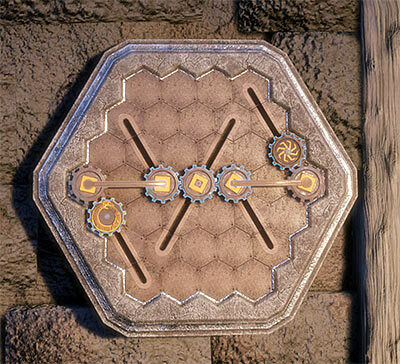 Talk to Stoney, and play Wildland's Whistle near stones again to see world map. Crux take Crux with you. Here you learned Song of Exploration (Ability) The Stone Remembers. It Rebuild broken stone structures. Use The Stone Remembers on water to rebuild small bridge. Rebuild Luck Stone using Stones Remembers. A Hero's Rest You found a ghost standing in a blazing fire, known as the Scorcherer, in Old Skara Brae. He claimed to be a trapped hero of old, bound in ghostly form all eternity. Maybe you can find a way to free him from his bonds. This is location for [A Stabbing Headache Quest]. You have to fight Cultists. Cultist's Journal on the ground. 31 Entrance to The Cellars of Kylearan's Tower Level 4. After you talk to Rabbie to finish [The Best Of Us Quest] you will get [Low Friends In Low Places Quest]. She want to help you with Thieves for Duke Kingston. You do not have to put Sybale into current squad. This key from Duke Kingston will give you ability to go to Baedish Lowlands next big location. With Smuggler's Key you can exit to Baedish Lowlands.